So today I have been thinking about Paquebots, which I believe is French for ‘Mailboat’ but is a term we use for all mail posted at sea. As a first day cover dealer this is the only chance you get to officially get a foreign postmark on British stamps. The basic idea is you hand a cover with a British Stamp on it to the purser on a ship, or put it a special post box, and when the ship reaches the next port it will be delivered to the local Post office and sent. The purser may add the ships cachet and you should get a paquebot postmark cancelling the stamps, but if you find yourself on board a ferry and have an envelope and stamp to spare why not give it a go. 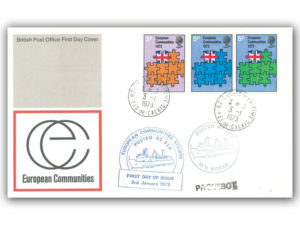 When we joined the EEC in 1973 there was some lovely covers produced with Sealink cachets and a Calais Paquebot cancel, maybe we could do a double when we leave. 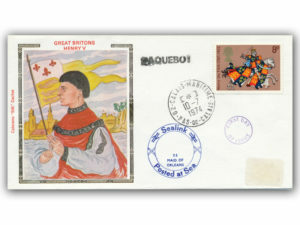 For the 1988 Spanish Armada issue, covers were shipped out to be postmarked in Santander Northern Spain, what could better than that as a First Day Cover. Doing these is always a gamble, sometimes a ship will leave one day and not arrive to the next, the crew may just say no or the postmark may be terrible, but when it works it will be something special. Next story Votes for Women First Day Cover + SWEETS!